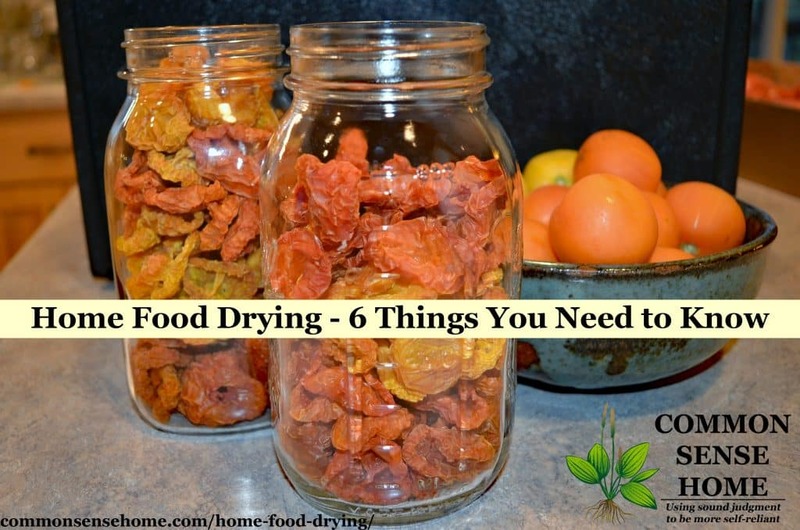 Are you considering home food drying? Want an easy way to store and preserve food? Need a food storage method that doesn't take up much space and requires very little equipment? Want to make healthier snacks for your family to enjoy at home or on the go? Looking for portable food for camping or backpacking? If you answered “yes” to any of these questions, you should learn about home food drying. What Equipment Do I Need for Home Food Drying? Specialty items such as cherry pitters and apples corers speed up processing, if you dehydrate a lot of those fruits. Commercial dehydrators give more consistent results and are easier to work with, giving you a better quality end product. Quick and uniform drying preserves color, flavor and texture. Most commercial units also allow you to set your temperature, which is very helpful for optimal drying of different foods. For instance, herbs dry best at lower temperatures so that you don't drive off volatile oils, while meats are typically dried at higher temps. If you purchase a commercial dehydrator, I highly recommend including the accessory sheets for fruits leather and fine mesh sheets in your purchase. They are so much easier to work with than improvised homemade options. I have a Nesco Snackmaster Dehydrator that I use for small jobs , and a nine tray Excalibur that's my real workhorse for large volume dehydrating. Oven Drying – Not recommended for households with small children. An oven can be used if you can set the temperature low enough (down to 140°F), but it will use more energy than a commercial dehydrator or other home constructed options. (Use an oven thermometer to check the temp.) To dehydrate food in an oven, set temp to warm and prop door open 2-6 inches. Place a fan near the oven door to improve air circulation. Use cooling racks on cookie sheets and space racks 2-3 inches apart. Air Drying – As long as your humidity isn't too high, you may be able to air dry. (Think herb bundles hung from rafters.) Some folks rig up trays with covers (see an example of a non electric dehydrator) and hang them near a heat sources such as a wood stove. A sharp knife and cutting board is helpful for cutting fruits and vegetables into thinner pieces that will dry more quickly and evenly. A mandolin or food processor for cutting can speed up slicing, but isn't absolutely necessary. A good sized, heavy duty pot is helpful for cooking down sauces and blanching fruits and veggies. A pot with a thick bottom allows you to simmer sauces slowly without burning. Blanching (pretreating food by dipping them in boiling water) is recommended for many vegetables and some fruits. I like using my salad spinner to clean and dry herbs before loading them into the dehydrator. What Types of Food Can You Dehydrate? Just about anything can be dried, from vegetables and fruit to meat and fish. Home dried herbs are a fraction of the cost of store bought herbs. Natural fruit leathers are also quite expensive in the store, and are one of the simplest things to make in your dehydrator. 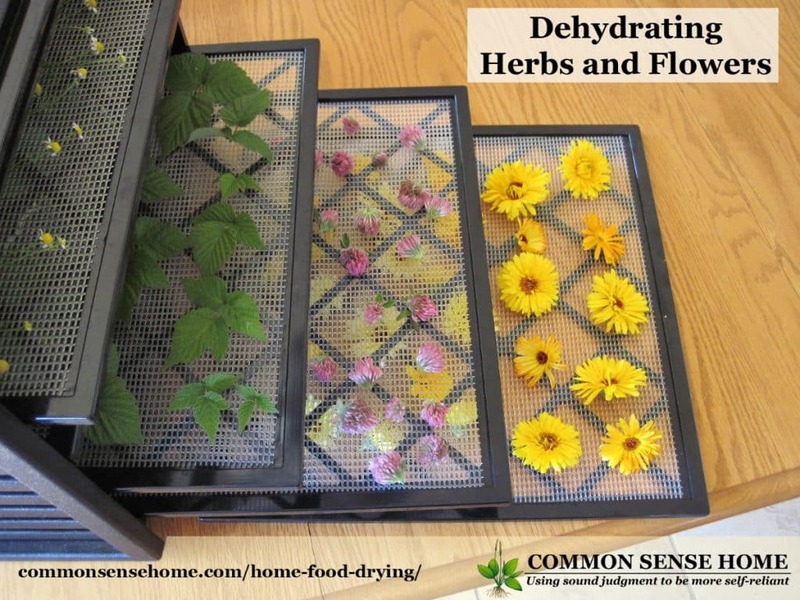 You can use your dehydrator to make snacks for people and pets. You can also use it to dehydrate excess kefir grains or sourdough starter. Home food drying works to preserve food by reducing the water content in food, making that food inhospitable to mold and bacteria. High fat foods don't tend to dry well and are more prone to spoilage. Always use extra care when dehydrating any meat products. It's best to store dried meats in the fridge or freezer. How do I Prepare Food for Dehydrating? Generally, you want to slice or chop uniform pieces of food between 1/8 and 1/2 inch thick. Food that is too thick or irregularly shaped leads to non-uniform drying, which may cause spoilage. Blanching in water or steam helps slow down enzyme action and softens skins. This makes it easier for moisture to be driven out, and makes the product tastier when rehydrated. Many vegetables (but not all) are best blanched before dehydrating. 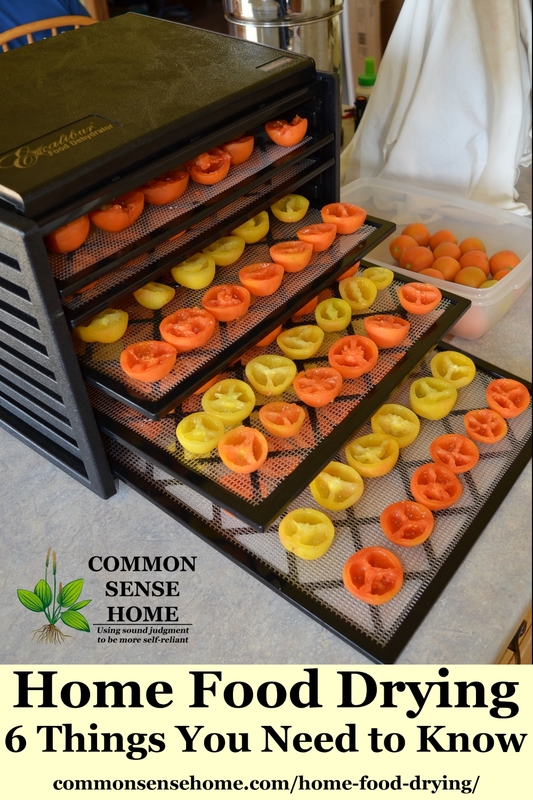 See Vegetable Dehydrating 101 for a printable list of vegetable blanching and drying times. 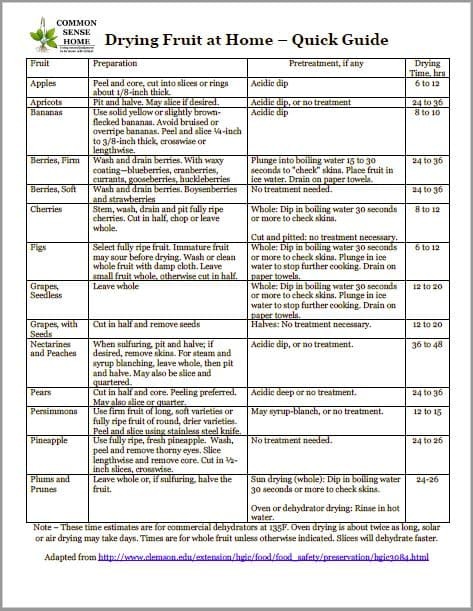 Click here or on the image below to download a pdf of dried food prep and drying times guide. Checking Fruit Skins – Skins naturally protect fruit to keep it from drying out, so they need to be “checked” (broken in some way) to speed drying. You can blanch, poke holes, cook in syrup, slice or freeze and thaw to break the skin. Most of the time I slice and dip. Some foods are pre-treated before drying to help to preserve color and flavor. Fruit Dip – Fruits can be dipped in saltwater, and acidic liquid or something sweet to reduce oxidation. This keeps them from turning brown. My favorite method is to use a couple of tablespoons of lemon juice in a bowl of water. Inexpensive, easy and doesn't dramatically change the flavor of the fruit. Many people also enjoy dipping sliced fruit in other acidic fruit juices, such as apple or banana slices in pineapple or orange juice. In the chart above, “acidic dip” means the fruits should be dipped to prevent browning. Home food drying time depends on the food and the drying conditions. Dehydration takes anywhere from a few hours to days, depending on what you are drying and how you are drying it. Thinner items dry faster than thick items. Higher sugar content increases drying time. Fat increases drying time (and risk of spoilage). High humidity increases drying time. Units with fans dry faster than units without fans. Air drying can go pretty slowly, but still works well in some situations. Most of the time I load my dehydrator in the evening and let it dry overnight. A friend in South Carolina with a simple on/off dehydrator (no temp control) found that she couldn't dry thicker items before they grew mold due to the high humidity. 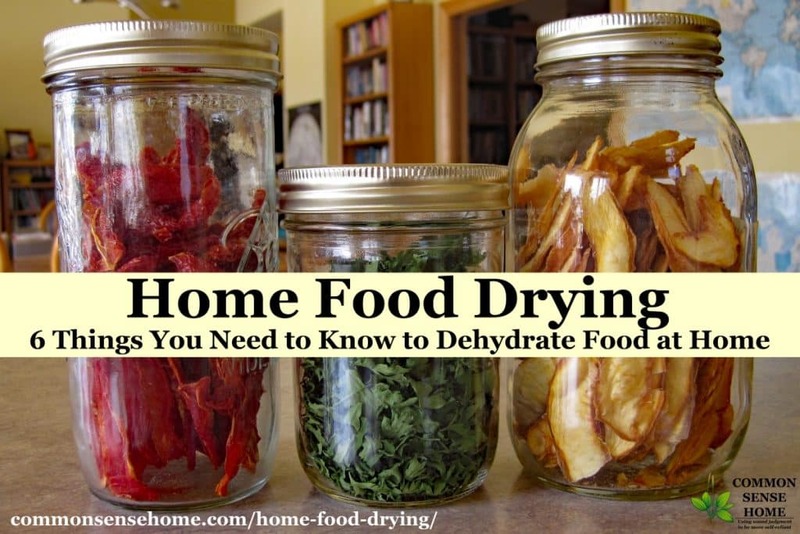 How Can I Tell if Home Dehydrated Food is Dry Enough? Most foods will have a moisture content of around 20% when dried. Different foods will have different textures when dried, from brittle to leather-like to gummy. As you work with dehydrating, you'll get a feeling for appropriate dryness. The texture of home dried foods may be different than commercially dried foods. Remember, you're making your products without strange additives or deep frying or other commercial processes. Allow food to cool before packaging to prevent sweating in storage. To condition your dried food (and evenly distribute any remaining moisture), shake the jar daily for about a week. Watch for moisture. If any moisture shows up, dehydrate the food more. At the end of the week, repack food as desired for long term food storage or short term munching. How do I Store Dehydrated Food and How Long Will it Keep? I prefer to store dehydrated food in standard or wide mouthed mason jars. If I have a lot of a product (enough to fill multiple jars), I use the vacuum sealer attachment for my Foodsaver to seal the jars and extend shelf life even further. I keep fruit, veggies and herbs in jars out of direct light (in the pantry), and/or cover them with sock cozies. You can also use plastic bags or plastic jars, glass jars from other commercial products or Mylar bags. Store dehydrated meat products in refrigerator or freezer. Storage life depends on conditions. Dried food found on archaeological digs was still technically “edible”, but definitely not a yummy. Dehydrated produce and herbs should last around a year (from one season to the next) if properly stored. Dried meats are best used within 3-6 months. I've kept items longer, but flavor, color and nutrients diminish over time. Below is an assortment of links from my blog and other other online resources to help you with home food drying. National Center for Home Food Preservation – How Do I Dry Foods? 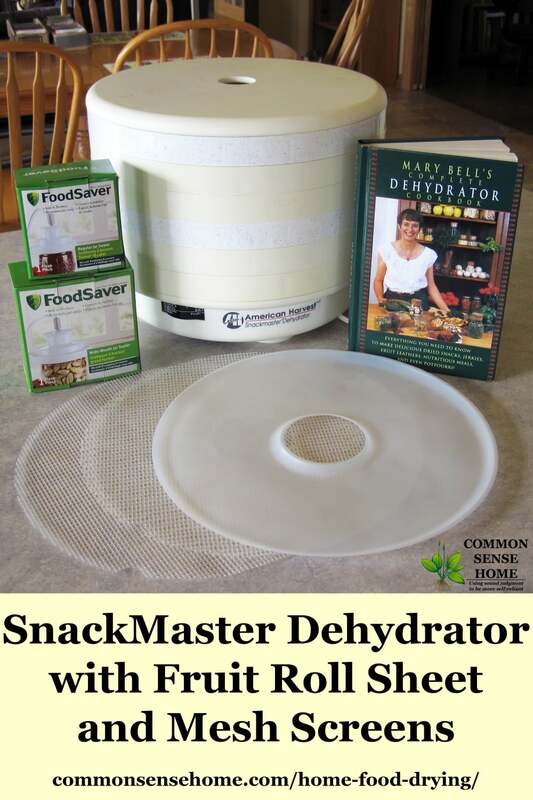 Dehydrate2Store.com – Instructional videos, delicious recipes using dehydrated foods, pantry stocking with home food drying and more. Living Foods Dehydrators – Wooden dehydrators made in the USA, or buy the kit and make your own. Box fan dehydrator – Alton Brown's box fan dehydrator made with a box fan, cellulose furnace filters and a bungie cord or two. A note on sun dried fruits: Because they are dried outdoors, there's a greater risk that sun dried fruits might have insect infestations. There are two ways to kill off insects and their eggs – freeze them or heat them. To cold kill, place the dried food in a freeze safe container and put it in the freezer at 0°F or below for at least 48 hours. To heat kill, place food in a single layer on a shallow pan. Heat at 160°F for 30 minutes. Is Home Food Drying Right for You? Dehydrating is a simple method of food preservation. You can purchase a basic dehydrator for under $100 and you're ready to rock and roll. Prep time and difficulty for drying fruits and vegetables is minimal. The biggest concern is making sure that your food is dry enough that it won't spoil. You also want to follow basic food safety guidelines to avoid potential contamination, since the food is not sterilized during drying. For longer storage (up to 25 years or more), home freeze drying is a better choice. See “Dehydrator Versus Freeze Dryer – What's the Difference” for a comparison of dehydrating and freeze drying. Do you dry food at home? What technique/equipment do you use? Originally published in 2012, updated in 2014, 2017, 2018. Homemade jerky such a great value, too, compared to store prices, plus the store jerky is typically loaded with preservatives. We just made up a batch of venison jerky last week. It makes a great, low carb salty snack. Oooh, we are very interested in experimenting with food drying. Thank you for the very helpful post! Will definitely need to remember this post! I’m hoping that this coming season will be better than last year. We had a rough season last year, too. I normally have more to share, but last year we didn’t even have enough to store what we usually store. What a coincidence!! I’m doing a big garden this year, complete with herbs, and just this morning was thinking of getting a dehydrator! I can’t wait to look around all the links, thanks so much for all this information! Monica – I hold you find the links useful. I just made up some fruit leather yesterday, and am planning on drying some extra water kefir grains today. The dehydrators are $20 right now at Aldi’s Food Market. Rush!!! I bought one, and just dried tomatoes after sprinkling them Jewish rock salt and a tiny bit of sugar. 14 hours. They’re delish! I put them in a plastic container of virgin olive oil, and they’re sitting in my refrigerator. I hope to use the olive oil they’re resting in for salad dressing and tomato-basil pasta later. Question: Should I freeze them instead of refrigerating? I’d be hesitant to store them in plastic for any length of time in either the fridge or freezer, as they will pick up “plastic” flavor. There is a very small risk of botulism with foods stored in oil, as explained in the Natural Canning Resource Book – https://commonsensehome.com/the-natural-canning-resource-book-book-review/, so the freezer would be safer if you want to store them for any length of time. The wolfgang puck (yes, that’s the name) food saver is $30 now and I paid $50 for it a few months ago. I like it, no problem, and just received the mesh trays I ordered. I ordered the mason jar sealer online and have sealed flour, cornmeal, and all my dehydrated fruits and vegetables. Nice and very insightful. This post has covered all the things anyone new to food dehydration would need. 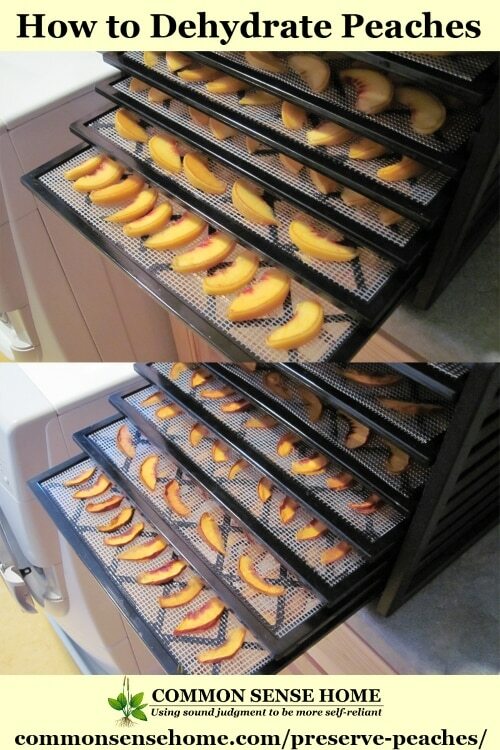 I love the fact that you also shared other ways to dry foods, like DIY food dehydrators. Great job and thanks for sharing! Mary Bell’s Complete Dehydrator Cookbook has full instructions for fish and shrimp. We don’t eat many fish since my husband had an unfortunate incident with a tapeworm on a Boy Scout camping trip. Note: Do not eat undercooked fish! Thank you for the tip on the dehydrating book. I normally don’t eat fish that I haven’t caught or cooked, so I’m pretty careful. Panfish are my favorite to eat as well, so cooking times are relatively quick but thorough. I’m hoping to be able to dehydrate them for food storage purposes. If that doesn’t work maybe I’ll smoke some (small bullhead or catfish though). Have a nice weekend. I don’t know if them have them in your area, but in northeast Wisconsin and the Upper Peninsula, they have something called “fish boils”, where the fish chunks go into a pot to boil with other foodstuffs. That’s where he got hit. Smoked fish is really good! I’ve heard of fish boils but never have tried it. They mostly use walleye in the boils here (on Lake Erie). Sounds like a Gumbo..lol. Gonna have to try it sometime. If your humidity levels aren’t too high, solar food dryers can work great. I mostly use mine for mushrooms, but also herbs, and fruit. I do jerky in the oven…too messy for my dehydrator. We have had it several years, with more extensive use more recently. It died on us in the middle of a batch 🙁 So, now we are trying to make a wise, long lasting decision, but somewhat quickly, given we are right in the middle of growing and harvesting season. Thanks for all the helpful information, on this, and all your other topics! Hi Laurie – great website! Well done – I’m going to bookmark this one. OK, I have a wee problem. 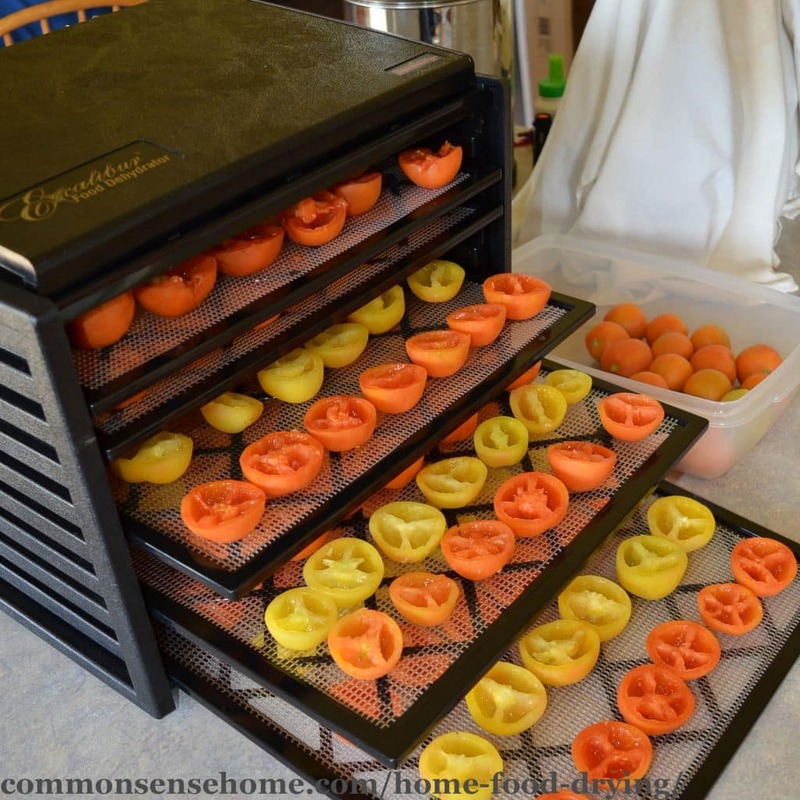 I love drying fruit and vegetables in my dehydrator (I used to call it my “demystifier”) and everything generally turns out well, but my partner says my tomatoes are too hard and chewy, even though they’re a lovely colour, and in olive oil. Do you have any tips or tricks for softening them posthumously, as it were? I have a couple of books on drying, but there’s no suggestions in either of them. Any ideas from you (or other commenters) well appreciated. Try slicing the tomatoes in thin slices across the width of the tomato so you get less skin in each slice, or blanch and remove peels before drying. If you have tomatoes that are already preserved, try chiffonading them as finely as possible when using, or remove them from the oil, slice finely and replace in oil to expose more surface area for them to absorb oil. In your pre-treating paragraph you say ‘BOWEL of water”. Oops, funny. Thought you might want to fix that. Great info, I appreciate all the hints from someone who has been dehydrating for a while. I tried making a solar dehydrator a couple of years ago. Needed a better building plan, and a reality fix, because we live with such high humidity here in Michigan summers that it just doesn’t work. I bought a used dehydrator, and have experimented successfully with blueberries, herbs, celery, radishes, and such as these. Again, thanks for the great info. Living next door in Wisconsin, I’m in the same boat as far as humidity. Lots of things would rather spoil than dry if drying is attempted via a non-electric method. In fall when the humidity drops I have a little more luck. I’ve had my dehydrator for a year now and it’s wonderful. I dry fruit and veg and quite often will then reduce to powder and mix a variety together and this forms a basis for stock along with dried mixed herbs, kale, spinach and peppers. Being on my own means I can buy in larger quantities, and grow my own, then have a store cupboard full of veg and fruit. I’ve also just dried a batch of salt dough hearts in the dehydrator and last year made pot pourri for Christmas presents. All I need now is a vacuum sealer. Oh yes, you’ll love your vacuum sealer when you get one! Lots of times the local stores have sales during preserving time, and I bet there will be some good deals for amazon prime day, which is coming up soon. I love to be able to go to the pantry and have a variety of foods on hand. It makes me happy. I’m thinking about getting into dehydrating, but my question is, how do you cooked with the dried food afterwards, such as tomatoes? Can you recommend ways to eat the food after dehydrating and storing it? Thanks! Wonderful site. My husband and I live in the suburbs and are experimenting more with homesteading, with plans to one day move out into the county with some more land. Great resources! Glad you’re enjoying the site, Shenley. For specific recipes using dried foods, any of the recommended books would be a help. In general, dehydrated foods require plenty of time with able liquid and low heat to rehydrate properly. I’ve used diced dried tomatoes to thicken sauces, stews and soups. Tomato leather can also be rehydrated into juice or sauce. Soups and stews are good choice for rehydrating veggies, or paired up with braised meats slow cooked in the oven with plenty of liquid. Most of our dried fruit we eat “as is” for snacks, but you can rehydrate and use for baking in pies or crumbles, or chop it up and mix it into quick bread batters such as muffins or pancakes. Excellent article on dehydrating, My kids love dehydrated food especially dehydrated bananas.